In many respects, a black sense of humor is the only appropriate response to the madness of war. Even a film as earnest and tense as The Hurt Locker is laced with a mordant sensibility, which seems to be part of the necessary armature of a warrior in our time. Or in any time. 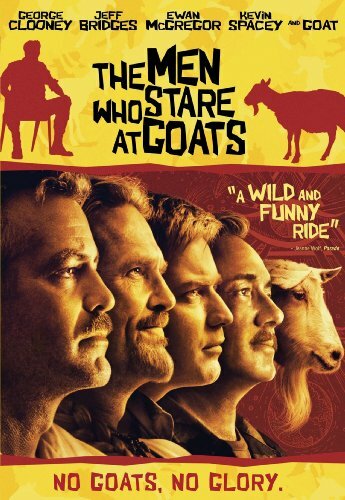 The Men Who Stares at Goats seeks to mine this vein, established as far back at least as Aristophanes, and coursing through films like Dr. Strangelove and Catch-22—but a jokey sense of life's ironies isn't in and of itself enough to make a good movie, as you'll discover if you watch this one. It's easy to become enchanted by all those stellar names above the title, but the pedigree of the project alone can't pull you through ninety minutes, and alas this one never quite figures out enough of a story to bring us in. The film is based on a deadpan account by Jon Ronson, who himself becomes the rather fictionalized narrator played by Ewan McGregor. (Ronson is English; McGregor's character writes for a newspaper in Ann Arbor, and seeks out an embedded assignment after his wife leaves him for his boss.) But as much as anything else, it's a film about the odd intersection of military culture and the New Age movement, and about how the former tried to skim off some of the latter to make itself more efficient at, well, killing and conquering people. Jeff Bridges plays the high priest of this New Earth Army—he's a Vietnam vet looking to put together a platoon of warrior monks and establish a new paradigm. One of the things that the movie is smart about is confirming our suspicions that the huge Pentagon budget isn't full just of legitimate expenses and the proverbial waste, fraud and abuse; but also some stuff that's just flat-out batshit crazy. McGregor meets up with George Clooney and his silly moustache; only the former is one of Bridges' "remote viewers," that is, a soldier cultivating a sense of extrasensory perception in order to serve the corps. The troops of the film's title aren't doing intense observation—the goal is to stare at a goat and channel so much negative energy toward it that the animal's heart stops. Much of this may indeed be true; but the film is much to satisfied with its smirky sensibility. Everyone involved loves to be in on the joke, but they're not much interested in sealing the deal with the audience, so we're largely on the outside looking in. And a plot of sorts is grafted onto what's really just a series of blackout sketches—it just doesn't add up into a whole movie, and director Grant Heslov's touch isn't especially light. Much of this plays like a heavy-handed Coen brothers imitation, with more politics and fewer setups and punchlines. Heslov does have a keen ear, though—I especially like the use of More Than a Feeling on the soundtrack during an ESP montage—and wisely hired director of photography Robert Elswit, whose work these days is as stellar as anyone's, on the heels of films like Michael Clayton and There Will Be Blood. Kevin Spacey shows up late as the discontented psychic who wants to be teacher's pet—he's a plot necessity more than a character, unfortunately, and even an actor of Spacey's character can't fill in all of those blanks. The extras package will likely only ratify your assessment of the feature. On the first commentary track, Heslov calls the script "the best screenplay I have ever read," but doesn't elaborate much, and offers just a hodgepodge of memories of the production history; on the second, Ronson seeks to ferret out fact from dramatic license. (He's an occasional contributor to This American Life, so hearing his cool cadence, you start to anticipate the payoff that never comes.) Goats Declassified (12m:09s) features Ronson and some of the characters' real-life counterparts; Project Hollywood (7m:33s) is a standard making-of piece. A group of deleted scenes are just snippets, running less than three minutes; and along with an original trailer are a collection of "character bios," really just teaser pieces for the feature.